Are Elk Antler Chews Safe for Dogs to Chew? Learn why antlers are a favorable alternative when it comes to dog chew products. There are countless products out there made for dogs who love to chew. From rope toys, to bully sticks, to rawhides, the collection of available chew toys is nearly overwhelming. You may be wondering which of these chews are best suited for your pet. In our opinion, antler chews are among the best choices for pets when it comes to both health benefits and safety factors. Chewing is actually a healthy, normal habit for your dog. It contributes to oral health, keeps them out of trouble and is healthy way for them to expend energy. In fact, chewing releases positive brain chemicals and, therefore, keeps your dog more content. It can also reduce feelings of anxiety or frustration. Dogs of all ages, but especially puppies, chew as a way to explore their surroundings. In puppies, it also can aid in releasing pain resulting from tooth growth. In older dogs, chewing upholds oral health and helps to keep their teeth clean and jaws strong. How Are Antlers Made or Sourced? The use of antlers as dog chews is not a new, cutting-edge concept. While the popularity has recently grown, dogs have been chewing antlers likely since they became domesticated animals. Antlers only grow on male species, because they are used to fight off other males to show leadership or to defend a mate. Most commonly, dog antler chews are sourced from elk and deer populations. There are TONS of benefits to “chewsing” antlers for your pup! Okay, now that our terrible pun is out of the way, let’s discuss. 100% natural antler chews help clean teeth & last and last! 100% natural, North American deer or elk antlers are ideal for puppies, aggressive chewers, and large dogs because they last a very long time and rarely split, splinter or chip. Dog owners with allergies will be relieved to find out that they’re non-allergenic and improves your dog’s coat, subduing the negative effects it may have on your allergies. What are some other benefits of choosing antler chews over other dog chew products? As with any chew toy, be sure to monitor your dog as they chew antlers. Be sure the antler chew is large enough so that there is no possibility that your dog could choke on it. It is also advised to regularly check your antler chew over for any sharp edges. If there you notice any, you can remove them by rubbing the sharp edge against concrete or sandpaper. Finally, you should limit your dog to chewing no more than ½ to 1 inch of the antler per day. Because the antlers contain rich protein, large amounts ingested all at once can cause a upset stomach. Supervise what your dog is doing when he’s mid-chew! Because of a dog’s nature he’s likely to finish it in one sitting, which could cause an upset stomach. Choose appropriately-sized antlers for your dog to chew. Like Dr. Nunez said, dog’s can very easily swallow things – and just as easily choke. Monitor what else he intakes. If he’s sneaking into the food or if you’re feeding him too many treats too often, he could develop a weight problem. Check over his teeth and gums once he’s done, any blood on the antler itself is not a good sign. Any wound should be treated in accordance to severity (if he seems happy, he probably is, a little blood isn’t the end of the world). Just use your common sense. Go Get Some Elk Antlers Today! If you’re ready to surprise your lucky pup with one of his favorite treats (whether he knows it or not! ), try one of Wapiti’s all-natural, homegrown, deliciously-snarfable elk antler chews! 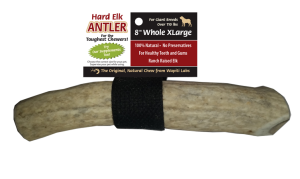 The 8 Inch Split Elk Antler Chew is the perfect size for those larger breeds. They’re water rinsed straight from our elk raised ranch, so they’ve never been submitted to any chemical treatments. Our elk antlers are fresh, so they rarely splinter. This treat is safe and enjoyable for your pet to chew! I love how you mentioned that elk antler will be able to help keep one’s pet teeth clean while giving the benefit of it being 100% natural. That is perfect as we just welcomed our new pup in the family and keeping his dental care safe is my current priority. I’ll be sure to have a look around for a relatively large elk antler dog chew to make sure he won’t be able to swallow it. Thanks!